At a time when Italian painters and sculptors were working in the dramatic, naturalistic idom that we call Baroque, a small group of artists in France revived the elegant, self-conscious style of Mannerism. One of these masters was Jacques Bellange, a painter, decorator, and printmaker who worked as a court artist at Nancy, capital of the independent duchy of Lorraine. The artist's position at court is attested by his knighthood, which he proudly noted when signing his prints. Bellange's work combines overly aristocratic refinement with elements of religious mysticism. 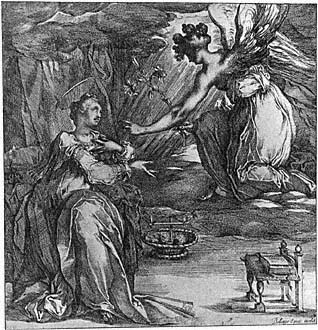 This etching represents the moment when the Virgin Mary, interrupted at her weaving with a prayer book open beside her, learns from the Archangel Gabriel of the impending birth of Christ. As she looks up at God's messenger, who presents her with a lily, the symbol of purity, her face reflects innocence and piety- simple emotions that contrast with the artificiality of the image. In the intensity of this glance, as well as in the archangel's silhouetted profile and the balletic hand gestures, are expressed the artist's religious fervor. The proportions of the figures are unnaturally attenuated, and their postures are constricted and twisted. They are pressed close to the picture surface, while the background is a confusing array of furniture, draperies, clouds, and flashing rays of light.